Senior living providers might have the secret sauce to save the Medicare program more than $15 billion each year. That’s the message from Bloomfield, New Jersey-based Juniper Communities, which provides assisted living and memory care services at 22 communities in Pennsylvania, New Jersey, Colorado and Florida. Likely thanks to the company’s Connect4Life integrated care model, Juniper’s high-acuity residents are hospitalized far less often than similarly frail seniors in the general Medicare population, according to research findings released last spring. A new independent analysis shows what this means for Juniper in dollars and cents, and how those cost savings might translate to the U.S. health care system at large. Juniper has been able to achieve a hospitalization rate of 0.30 events per person per year for a population of 471 medically frail seniors, all of whom participate in Connect4Life. That compares to a hospitalization rate of 0.65 events per person per year for a population of 3.42 million Medicare beneficiaries who have a similar profile to the Juniper residents, according to the analysis done by Anne Tumlinson Innovations (ATI). Washington, D.C.-based ATI was founded by Anne Tumlinson, a health care and aging services expert who previously was a vice president with research and business intelligence firm Avalere. With average spending per hospitalization calculated to be $10,399, Juniper is saving the Medicare program between $3.93 million and $6.04 million each year by reducing hospitalizations, according to the new ATI analysis. If the larger population of similar Medicare beneficiaries had the same hospitalization rates as the Juniper residents, the aggregate savings would be between $10 billion and $15.3 billion annually. Throughout the passage and implementation of the Affordable Care Act, and in the ongoing debate about how to refine or replace the ACA, legislators and policymakers have been seeking ways to improve health outcomes while reducing spending. These new findings show that senior housing can help achieve these elusive twin goals, Juniper CEO Lynne Katzmann told Senior Housing News. Connect4Life is about integration and coordination. One part of the program is on-site primary care, therapy, pharmacy, and labs; Juniper also has hired medical concierges to ensure that these services are working smoothly together and meeting the needs of residents and their families. A shared technology platform—the PointClickCare EHR—facilitates communication and teamwork among all these stakeholders. In light of the new research findings, senior living providers obviously might want to consider implementing similar programs, Katzmann said. While there are costs associated with starting and running Connect4Life, it has not only decreased hospitalizations but increased resident length of stay, Juniper has found. It also helped differentiate Juniper from competitors. There’s the potential for additional financial benefits down the road, Katzmann believes. Katzmann sees a few potential ways to change this situation. For instance, senior living providers could negotiate with an accountable care organization (ACO) to help manage its patient population, and receive payments from the ACO for hitting cost benchmarks. Medicare Advantage presents another opportunity. These are Medicare insurance plans run by private sector organizations such as UnitedHealthcare. MA plans are growing in popularity and they have some latitude in defining their scope of benefits, so this could be a logical starting point for greater senior housing involvement. “What the government needs to do quickly is allow MA plans the flexibility to cover some of the services we provide,” Katzmann said. Some senior care organizations have begun to offer their own MA plans, and this is something that Juniper might do down the road, she added. Tumlinson also sees potential referral benefits for providers that can achieve outcomes like Juniper. While senior housing can and should coordinate with other the larger ecosystem of medical providers, this does not mean the industry needs to “medicalize” its operational model, Katzmann emphasized. Juniper still operates on nearly a 100% private-pay basis, and it maintains a hospitality-forward look and feel. Tumlinson rejects the notion that senior living needs to focus on hospitality more than health care, or vice-versa. 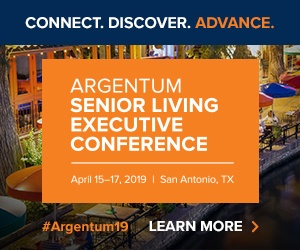 Acuity is not only growing in assisted living, but in independent living, in skilled nursing, and in the aging U.S. population at large, Tumlinson emphasized. It’s this large-scale shift in health care needs that really has her attention, and Katzmann’s, as they look toward the evolving role of senior housing.